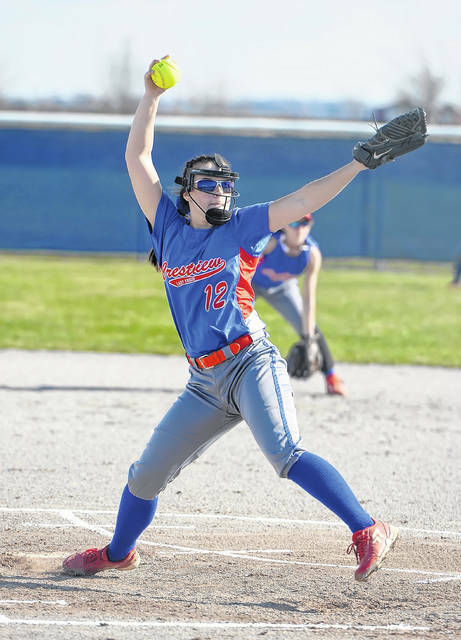 Crestview’s Kali Small pitches against Bluffton during Mondays’ game at Owen Pugh Field in Convoy. Bluffton’s Libby Schaadt pitches against Crestview during Mondays’ game at Owen Pugh Field in Convoy. Schaadt helped herself at the plate by going 2 for 5 with a home run. CONVOY – Bluffton hitters seemed to sprinting to the plate in the sixth inning. Bluffton sent 12 batters to the plate in an eight-run sixth inning. 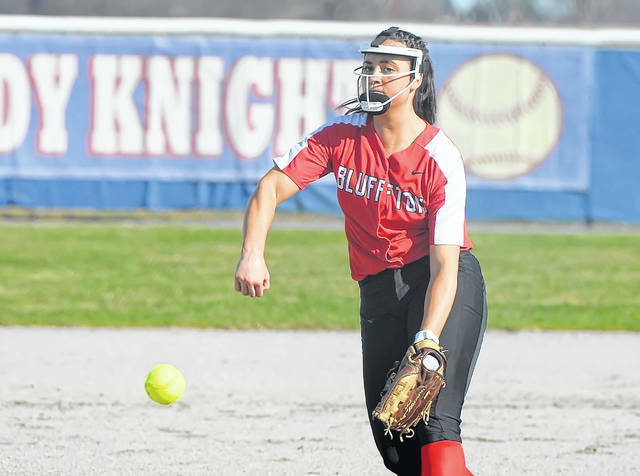 That was more than enough to power Bluffton an impressive 16-5 softball victory over Crestview Friday at Crestview. And consider Crestview led 5-1 after three innings. Bluffton scored two in the fourth to get within 5-3 before the Pirates’ eight-run onslaught in the sixth to pull ahead 11-5. Schaadt picked up the win and delivered the key hit, a three-run home run in the sixth, to give the Pirates the lead to stay 7-5. Bluffton, which defeated Crestview for the second year in a row, is 7-1, 2-0 in the Northwest Conference. Crestview is 6-3, 1-1 in the NWC. Bluffton pounded out 20 hits, with eight of the nine hitters in the lineup getting a hit. Every Bluffton hitter scored at least one run. For Bluffton, freshman Sophie Bricker went 4 for 5 with three RBI. Averey Rumer went 3 for 5. Brinkley Garmatter was 3 for 6 with three RBI. Katie Prater went 2 for 6 with two RBI. Schaadt was 2 for 5 with a home run and three RBI. Freshman Riley Busch went 3 for 5. Madison Fleece was 2 for 5 with two RBI. Crestview scored five in the second to take a 5-1 lead. Schaadt said she made an adjustment after the second inning. The Knights’ Caitlin O’Hagan had a three-run double to give Crestview a 5-1 lead. But the junior Schaadt settled in after that and pitched shutout, three-hit ball the rest of the way. Schaadt, a three-year starter, went the distance for the Pirates. She gave up five runs, all earned, on six hits. She struck out 10 and walked two. Schaadt threw 115 pitches, 82 for strikes. Bluffton scored two in the fourth to get within 5-3. The Pirates then lit the scoreboard up in the sixth. Fleece started the inning with a double. Garmatter’s RBI double brought Bluffton within 5-4. Prater singled to put two runners on. Up came Schaadt, who drilled a 2-1 pitch well over the center-field fence for her second home run of the year. The three-run blast gave Bluffton a 7-5 lead. “Yea, I could feel it,” Schaadt said of her home run. The Pirates continued knocking the ball silly, sending eight more hitters to the plate in the inning. Bricker’s RBI single made it 8-5. Then, Garmatter had another hit in the inning, a two-run single, and it was 11-5. Garmatter had two hits and three RBI in the sixth. If that wasn’t enough, Bluffton tacked on five more runs in the seventh to finish it off at 16-5.
https://www.limaohio.com/wp-content/uploads/sites/54/2019/04/web1_CW-vs-Bluffton-RP001.jpgCrestview’s Kali Small pitches against Bluffton during Mondays’ game at Owen Pugh Field in Convoy. https://www.limaohio.com/wp-content/uploads/sites/54/2019/04/web1_CW-vs-Bluffton-RP003.jpgBluffton’s Libby Schaadt pitches against Crestview during Mondays’ game at Owen Pugh Field in Convoy. Schaadt helped herself at the plate by going 2 for 5 with a home run.